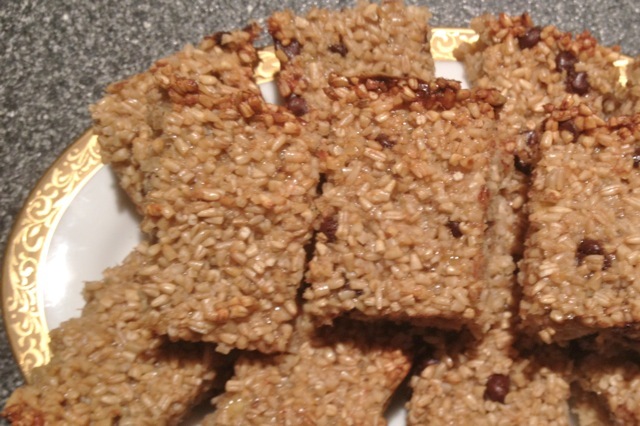 My son started back to school in August and that meant making these yummy Banana Oatmeal Squares. 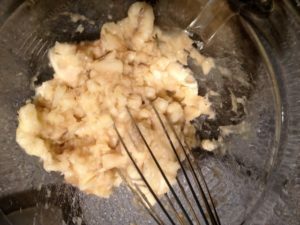 Luckily, I had a bunch of very overripe bananas on hand so it was a great way to use those (I also freeze overripe bananas to use in recipes). I did hit one snag and here is a general cooking hint (and one I usually follow): check to see if you have all the ingredients you need before you go shopping and don’t assume you have all the staples on hand. After I had already started making the squares, I realized that I did not have any rolled oats, but did have steel cut oats. The recipe was far more chewy with those, even after letting the batter soak for an hour. They were actually really good, just a totally different texture. Add the brown sugar, eggs, oatmeal and melted butter, stir until mixed. Stir in the mini chocolate chips. 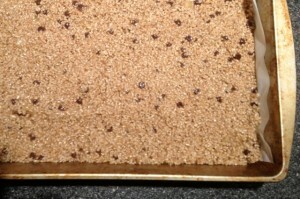 If using steel cut oats, let sit for at one or two hours (no more) before baking. 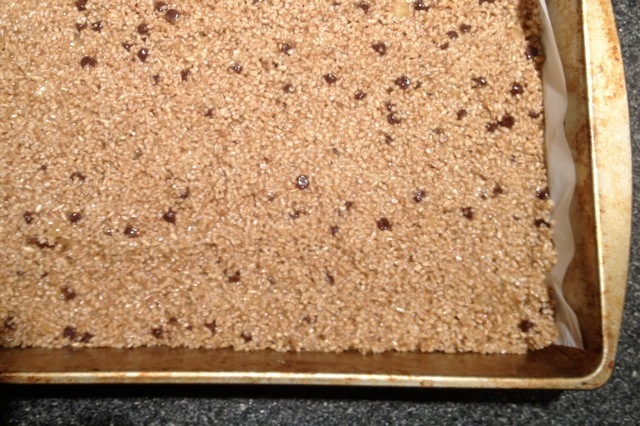 Pour the mixture into the 9 X 13 pan. Frugal Tip: Use what you have! I substitute ingredients all the time and the vast majority of time it works out really well and I save money. How? I don’t use time, money and gas to run to the store for the one ingredient I realize I have forgotten or assumed I had. Of course, if I did run to the store, I would have to pay the current price instead of waiting for a sale and inevitably, other things would follow me home and so cost me even more money. Also, sometimes when substituting, I use up what I have before it goes bad or expires, or I avoid purchasing a product that I will only use a tiny bit of. As a bonus, when I substitute with what I have, I often come up with new, unexpected flavour or texture combinations (as in the recipe above)! These look wonderful! I just linked to them in my “favorite finds” post today. I’m sure my readers will want to try them as much as I do. Thanks for sharing! I made this for dessert tonight. It is delicious. Taste a bit like banana bread but healthier I guess.